InterNations CUN January Get-Together and ALL YOU CAN EAT! The Ambassador Alex plus the Consuls Amanda and Merina have the pleasure of inviting you to the January Get-Together! 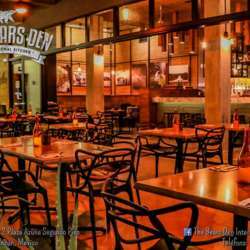 We will gather at 19:30 on Wednesday, 30 January, at the Restaurant/Bar called THE BEARS DEN INTERNATIONAL KITCHEN, it is an upscale venue located in the second level of Plaza Azuna just behind the Bull Ring (Plaza de Toros). VEGGIE: -Grilled avocado, -3 bean salad, -Crispy tofu, -Artichoke dip, -Grilled portobello, -Deviled eggs. THE SEA: -Alaskan cod, -Achiote grilled octopus, -Breaded shrimp, -Tuna tartare, -Salmon, -Scallops. MEATS: -Pork belly, -Braised lamb leg, -Mushroom risotto, -Pork dumpling, -Beef carpaccio, -Canadian picaña, -Buffalo slider, -Pork belly taco, -Roasted chicken, -BBQ pulled pork. DESSERTS: -Chocolate tart, -Gorgonzola and white chocolate cheese cake, -Canadian beavertail, -Xtabentun pannacotta. Will be great to start the year with everyone in such a great place, we are excited to see you!